Design determines results. A train will never fly no matter how powerful the engine because it is not designed to fly. A microlight aircraft flies with an engine smaller than that of most motorcycles. The problem with schooling is not that it’s failed but that it’s successful. It does what it’s designed to do..create mediocrity and conformity so that we have more and more compliant plodders who will never rock the boat, never question and God forbid, never rebel against injustice. It delivers very effectively what it was designed to deliver – obedient morons. Or to put it more charitably obedient servants for industrialists and the State. 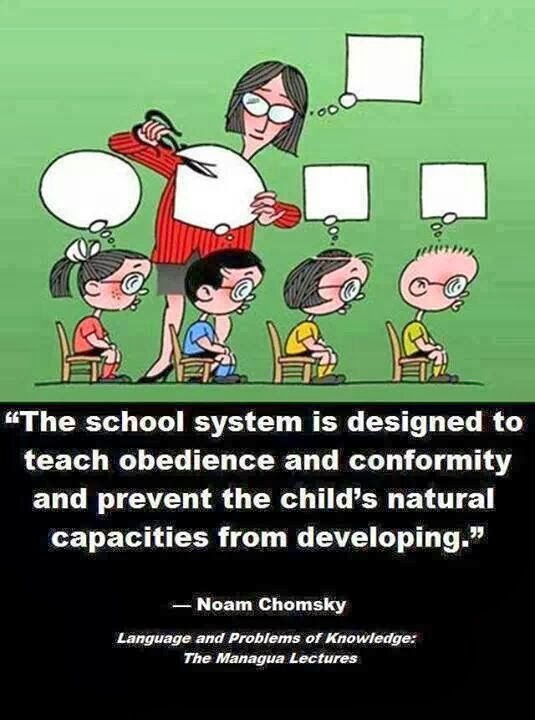 That is exactly what our education system does very well. We on the other hand want it to create children who will question, be creative, challenge the status quo, invent new ways to achieve results and generally buck the system positively. That is like expecting a train to fly by revving the engine. Our system is designed to create followers, not leaders. It is designed to create compliance not questioners. That is why we reward obedience and label questioning as disobedience and punish it. For the average teacher the ‘troublesome’ child is the one who asks too many questions in class. But it is only questioning which opens doors to new vistas and find solutions to problems which we don’t even recognize yet. We all agree that the pace of change is such that quite literally we don’t have a clue about what the world will look like five years down the road. The only thing we can be sure of is that it will look very different. We also agree that the two critical ingredients to success in that world are imagination and divergent thinking of which creativity is the result. Yet we have an education system that destroys these things very effectively, ruthlessly and quickly. If you doubt me ask yourself how many times you have heard the statement, ‘Forget that. You can’t get a job doing that.’ And you are right. He can’t get a job doing that. But perhaps he can create jobs for thousands if you leave him alone with his dreams and not destroy his creativity and divergence. Or maybe he will not even create jobs but will be a happy human being living his life to fulfilment. Now what’s so bad about that? But that terrifies the daylights out of you and so you force him to comply until he succumbs – another one bites the dust. If you want your child to be a leader with a chance to do something valuable, to leave a legacy of honor, to change society, to alleviate suffering, help the oppressed, stand up against injustice and be a credit to you, then formal schooling is the first thing you should save him/her from. Our education system doesn’t need change. It needs a decent burial. Then we need to put in place a system which is focused on developing the natural talents of the child, enabling him/her to leverage them to their greatest benefit and then help them to apply the learning. If you tweak a railway engine it will still not fly. If you want flight there’s nothing in the design of a railway engine that you can learn from. You need to forget railway engine and learn how to design something that’s the opposite of a railway engine. And that’s our problem…we’re trying to create a flying school using engine drivers. It’s not about fancy infrastructure and air conditioned classrooms but about opening minds, re-learning how to teach, writing new books and encouraging questioning, tangential thinking and unbridled imagination. The big problem in schools is that the whole atmosphere is soul destroying. Homes are not much different. So most children don’t look up to either their parents or teachers. And the fault is not theirs. Most parents and teachers are only fit to be quietly pushed under the bed when you have polite company. Generally parents today seem to believe that upbringing of children consists of satisfying their physical needs alone. So there is no focus on developing their minds, fulfilling their spiritual needs or teaching them manners and social skills. We program our children to fail when they are faced with life’s challenges and those that still succeed do so despite us, not because of us. 2. For how many of you is it a parent or a teacher? I have never had more than 5% of the audience which had as their role models, parents or teachers. That means that 95% of the population doesn’t look up to parents or teachers – though they are the two roles which have the maximum face time with children. Then I ask them another question: What do you think your children would say if they were in this room instead of you? Would they be thinking of you? The biggest problem today is a total starvation of role models. And that is the biggest challenge of education. Today we have confused education with literacy and knowledge with information and stuff the children’s minds with disconnected data which makes no sense and then test them on recall at a specific time and we call that process of regurgitation – exams. That has given birth to the industry of Examination Factories who exist only to teach children how to ‘crack’ exams. Learning is the last item on their agenda, if it is even there at all. All that the child is taught is to cram select information on the basis of questions that have been asked for that exam in the past and the Exam Factory’s analysis of what is likely to be asked in the exam that the child will take. Once he does that successfully his photograph is used as the bait to draw other aspiring fish into the trap of mediocrity. The champ in our system is that poor beast who can stuff himself with random information which he has no clue how to use and faithfully regurgitate it on call. If the poor child recalls that same piece of useless information (E.g. When was the Magna Carta written?) five minutes after the bell, he would have failed the exam. To know the place of birth of Shakespeare is essential to pass our exams – not to write creatively in English. No wonder that many of our successful ‘scholars’ can hardly carry on an intelligent conversation for ten minutes or write a powerful letter to the editor in the papers. Did you ever wonder why all letters to editors are written by old codgers with nothing to do – not by school children whose future is being squandered by adults who couldn’t care less? Our children spend on an average 15 years in what is called Primary, Secondary and High School and come out of there, completely unable to do anything useful, worthwhile or important in life. The only job they can get with 15 years of schooling is to wait tables for which also they have to be trained onsite. They can’t even do anything their education was supposed to teach them. How many school graduates do you know who wrote a book for example? After all they all learnt languages and passed papers in them for 15 years. And yet that is not enough for them to use that language creatively to express their thoughts. But we find nothing wrong with this. Their parents amazingly don’t think this to be odd at all even though they spent a fortune, which many could ill afford, on this thing they called ‘education’. I won’t even talk about how we squander science, math and humanities. Our society is the most powerful witness to that. In this whole process I can’t possibly under-emphasize the importance of wise adults in the lives of children that the children can look up to. But where are we going to find them? We don’t need huge numbers of them (not that it would hurt) but we need at least one or two in the life of each child. The problems of drugs, rave parties, teenage pregnancies, alcohol (also a drug though we don’t like to call it that) and so on are really symptoms of the sickness of our society. That these are to be found in our schools is a sign of how deep that sickness has reached. We are very, very sick. We need surgery – not pills. And certainly not placebos. Problem definition is always easy. Solving it takes a lot of time, pain and investment. And that is usually another story. But somewhere there is a spark, alive and waiting for the chance to flame into a conflagration that will light up the world.